What is like to be called into some of the most infamous cases in the world? How was Jimmy Savile finally exposed? Was Oscar Pistorius in-fact innocent? Join us for a gripping talk from one of the most sought after criminologists & investigative reporters, Mark Williams-Thomas, and get under the skin of some of the most high-profile cases the world has ever seen. Multi award winning investigative reporter and Criminologist Mark Williams-Thomas has far-reaching experience of working at the centre of very high-profile investigations. 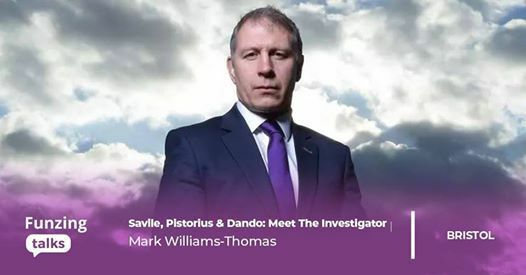 Mark’s ability to get exclusive access and interviews with key people is unprecedented, beating the world media to secure the only interview with Oscar Pistorius and finally exposing Jimmy Savile;which has since become the biggest media story of the decade. Over the past 10 years Mark has covered nearly all the major criminal investigations in the media - from the abduction of Madeleine McCann, the faked abductions of Shannon Mathews to the murders of Tia Sharp and Joanna Yates to the family slayed in their car in the French Alps. Mark’s determination to succeed is both empowering and captivating – failure is never an option. He is not scared to ask the difficult questions and put his body on the line to get to the truth. He is a master of detail and careful planning, with a unique able to think quickly on his feet. He is at his best when under pressure. This talk will have you captivated and inspired – giving you the inside stories of the many cases Mark has covered and answering your biggest questions. Held in a hand picked range of bars across Bristol, a Funzing Talks event makes the perfect after work activity.